A good all-rounder, with an even-handed approach that includes clear and purposeful bass and particularly fine definition in the upper octaves. Black Rhodium has embraced the Deep Cryogenic Treatment of cables whole heartedly and the Polar Illusion Cables products all feature it. The basic idea is to cool the conductor materials to very low temperatures – Black Rhodium quotes -196 celsius – so as to improve the crystalline structure of the metal. This is not wishful thinking: super-cooling is an established method in various industries which has been shown to increase wear resistance in various metals. What is still somewhat open to question is exactly what it does to the electrical characteristics of conductors, as measurements to date have been inconclusive, though there's plenty of anecdotal evidence for its effectiveness. This cable is a simple unshielded twisted pair, each conductor being solid silver-plated copper with PTFE insulation. The channels are lightly twisted together: one might think this would give terrible crosstalk but we tested it and the effect is negligible. Connectors are Eichmann Bullet Plugs. 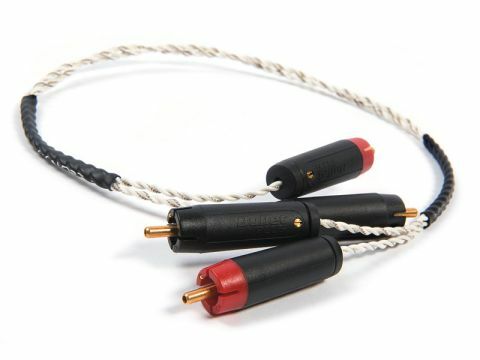 We've found a few Black Rhodium cables in the past to be quite fond of bass. This one certainly has no fear of low frequencies but, in fact, we were most impressed with the treble, which is admirably clear and crisp. With delicate percussion and harmonic-rich sounds like violin, there is a beautiful airiness to the sound which at the same time is very clearly connected to the midrange and bass. As a result, detail positively shines and it's a real pleasure to hear the inner workings of familiar recordings. Imaging is good laterally and has excellent depth, while tonality is very neutral.